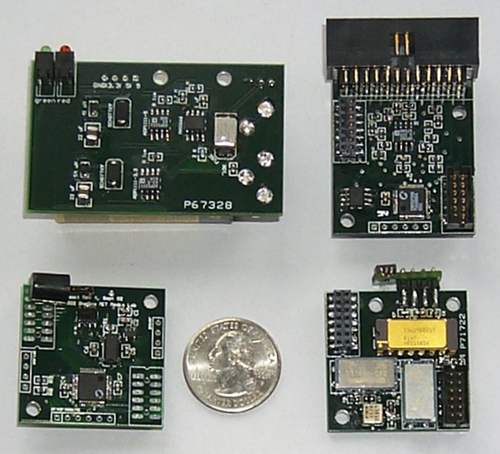 The goal of this project is to provide a simple modular framework for compact wireless sensing. 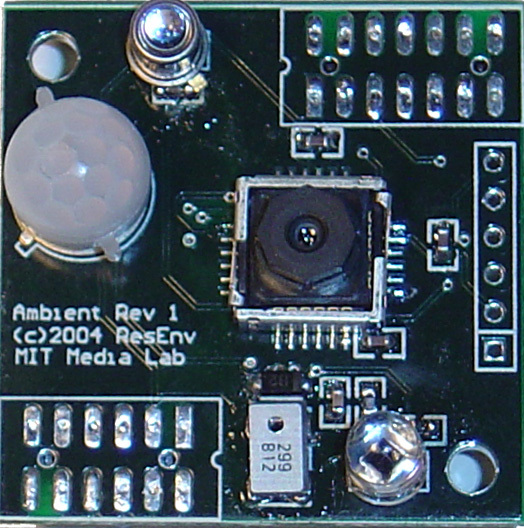 This platform is based around a series of circuit boards (or panes), each of which instantiates a specific sensing modality (listed below).This will allow faster prototyping by encapsulating design knowledge (such as RF) and repeated circuit structures (such as microcontrollers) in a single package which can be used in many different types of projects. As opposed to similar architectures, this system treats the sensor panes as discrete design objects that have data collection as their primary purpose. This compact platform will be useable in a wide variety of situations where there is a need for direct sensing of quantities of interest. This dense sensing, combined with low complexity recognition algorithms, will allow for combined perception and expertise in a single device. 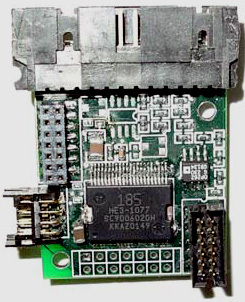 The platform hardware has a fixed 1.4 inch square board size, with a 26 pin connector between the boards. This connector provides 8 direct connections, 2 interrupts, multiplexer select/enable/data, SPI (master/slave), 3V/5V/12V power, and ground. Power is external to the system, allowing the power supply to be specific to the project. ·The master board is responsible for the data collection and transmission to the central basestation and is included in every project. 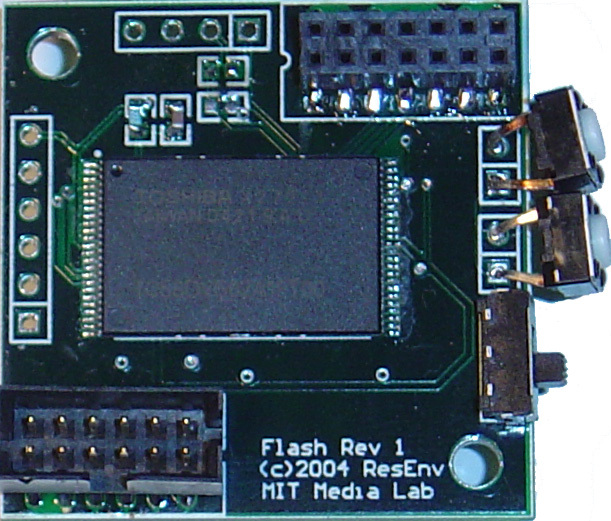 It currently contains a 22 MIPS Silicon Labs C8051F206 processor with 12-bit ADC as well as an RFM TR1000 916MHz transceiver running at 115.2 kBps. The processor pins are broken out to the interconnects mentioned above. Each pin can function as either a digital input, digital output or an analog input, and this state can be changed in real-time (adding to the flexibility of the system)..
·The IMU board is a six-degreeof-freedom inertial measurement unit. Acceleration is measured via two Analog Devices ADXL202 accelerometer (±2 g),one of which is orthogonally attached to the side of the pane to achieve the third axis of sensing. Angular velocity is measured via two Murata ENC03J gyroscopes and a single Analog Devices ADXRS300 gyroscope (all ±300 degrees/ sec). 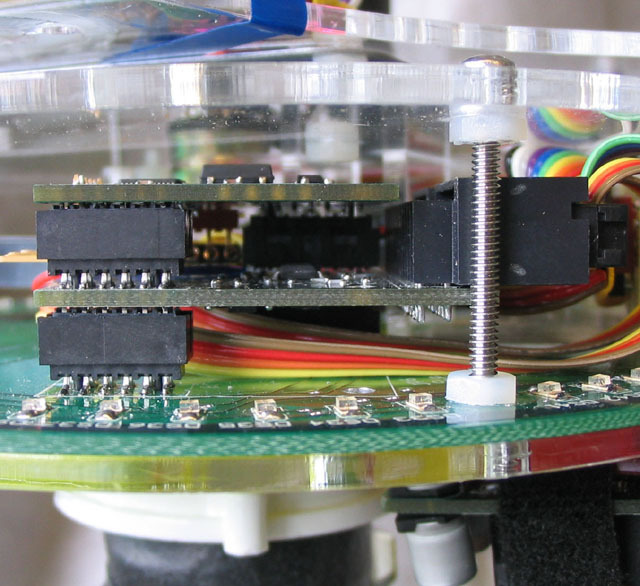 This combination allows for full 6-axis inertial sensing in a nearly flat package. A four-way static tilt sensor (ALPS SPSF1000) provides for micropower single-bit acceleration measurement. This board replaces the hardware used in the Compact Inertial Measurement Unit, and is currently being used on the wearable gait lab. 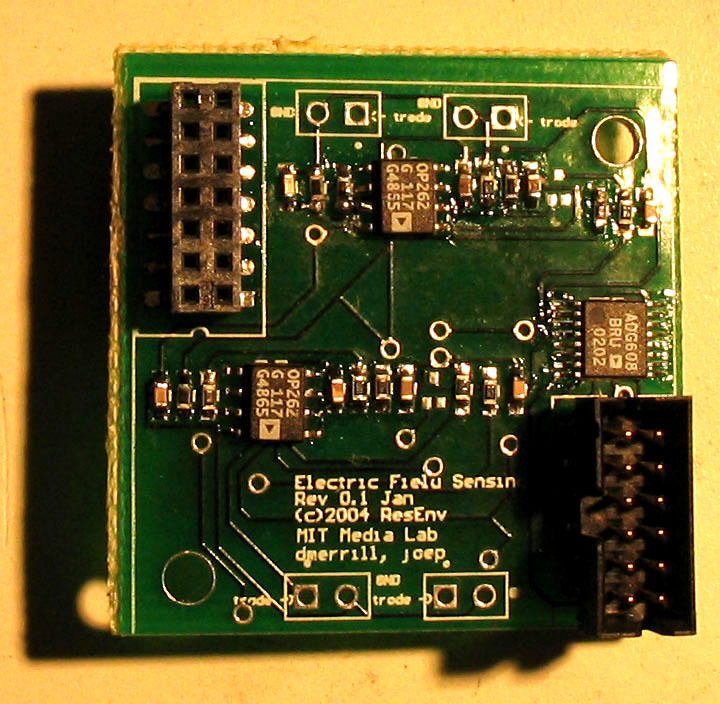 ·A matched pair of sonar receiver and transmitter boards allow for distance measurements. 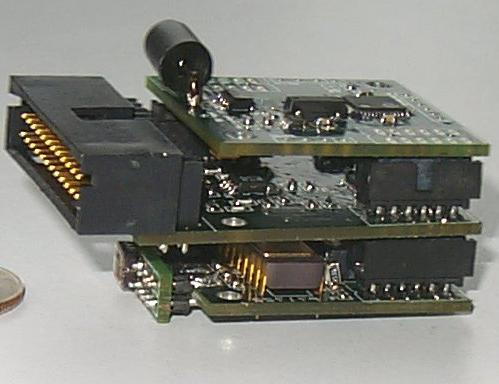 The transmitter board sends a single 40 kHz pulse from an omnidirectional transceiver (MSI 1005853), which is then received by two pickups (Gibson Tech V-MA40A5R) on the receiver board placed a fixed distance apart. A measurement of differential time-of-flight is allowed by synchronizing to the basestation’s TDMA messages, hence the two receivers allow both displacement and relative angle to be calculated. ·The tactile sensor board was developed for the wearable gait lab insole, although it can be used in any application requiring multiple channels of force sensor, vibration sensor, or bend sensor inputs. It includes inputs for four single-ended force-sensitive resistors (FSRs) via common-collector BJT amplifiers, two backto-back FSR bend sensors via a differential op-amp pair, and two piezoelectric sensors via common-drain FET amplifiers. 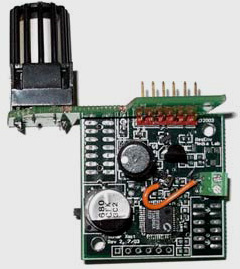 This pane also contains the circuitry for a Motorola 33794 9-channel loading mode capacitive proximity sensor. 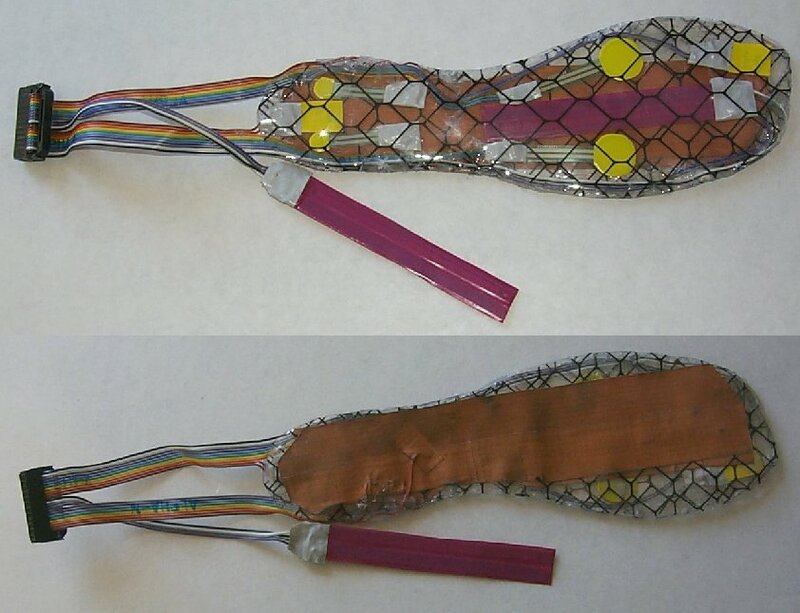 These are attached via a header at the top of the board, allowing them to be spatially distributed as desired (such as sensate gloves or shoe insoles). 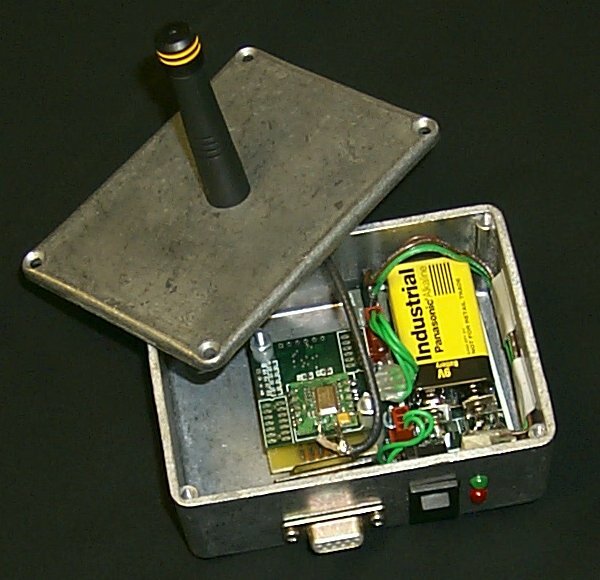 ·The ambient sensing board provides a range of methods of detecting audible and visible contents in the local environment. This includes a narrow cone (10 degrees) Osram BPX43 phototransistor and a wide cone (70 degrees) Osram SFH314 phototransistor. Dynamic heat sources are detected with an Eltec 442-3 pyroelectric sensor. Finally, a complete visual of the environment can be acquired using the ALPS FPDB0 VGA camera module. Acoustic pickup is provided by a SiSonic SP0103 microphone and a SiLabs F206 for preprocessing. ·The storage board stores data in a 1 Gbit flash memory chip (Toshiba TC58DVG02A1) and I/O is controlled by a SiLabs F206. 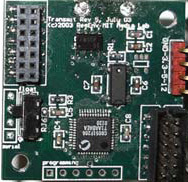 Data is input to the board over SPI and is output via an RS232 connection. 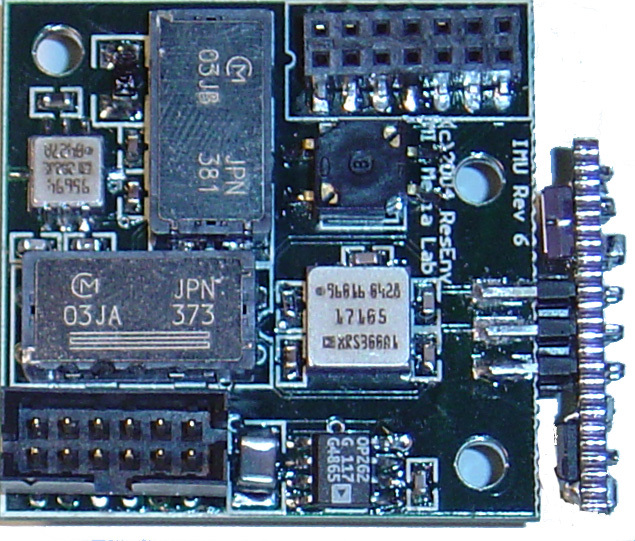 A central basestation is also built using this master board that manages a simple TDMA wireless protocol. While it can technically handle an arbitrary number of stacks, the practical limit is determined by the size of the data packet from each stack and the desired update rate. This star network configuration is a product of the wearable applications driving our development. Conversion of the platform to operate in a peer-to-peer mode should be fairly straight-forward. A number of different applications have been built using this architecture. We describe a few below. We will provide direct links to the highlights of the projects, but it is best to go to the project page for a full description. 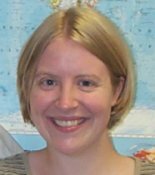 This research involves the development of an on-shoe device that can be used for continuous and real-time monitoring of gait. 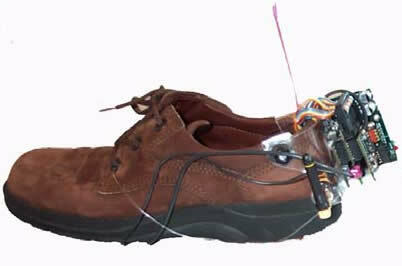 This work involves the design of an instrumented insole and a removable instrumented shoe attachment, which will send data wirelessly, providing information about the three-dimensional motion, position, and pressure distribution of the foot. Algorithms will be developed to analyze the data in real-time, and results will be validated by comparison with data from a commercial optical gait analysis system at the Massachusetts General Hospital (MGH) BioMotion Lab. A small clinical study using this device will be carried out at MGH investigating the effects of physical therapy on subjects with Parkinson's disease. Finally, real-time feedback methods will be developed in order to investigate the feasibility and benefits of using the continuous monitoring of gait for physical therapy and rehabilitation. Acoustic musical instruments have traditionally featured static mappings from input gesture to output sound, their input affordances being tied to the physics of their sound-production mechanism. More recently, the advent of digital sound synthesizers and electronic music controllers has abolished the tight coupling between input gesture and resultant sound, making an exponentially large range of input-to-output mappings possible, as well as an infinite set of possible timbres. This revolutionary change in the way sound can be produced and controlled brings with it the burden of design: Compelling and natural mappings from gesture to sound now must be created in order to create a playable electronic music instrument. 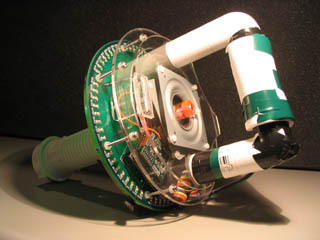 FlexiGesture is a device that allows flexible assignment of input gesture to output sound, so acting as a laboratory to help further understanding about the connection from gesture to sound.